Fat Girl to Thin: THAT WORKOUT WAS AWESOME! I wasn't really looking forward to my workout tonight, I was thinking this was going to be an in and out workout and I could get home early. I had no idea it was going to turn into an amazing workout that caused me to leave 2 hours later, soaking wet, happy, hurting, and ready for some more! I noticed a few weeks ago that my gym has WiFi. I didn't really understand the purpose of that until tonight. I had planned on taking in my iPad and just watching something while I jogged on the treadmill. I couldn't go outside so run inside was the best I was going to get. 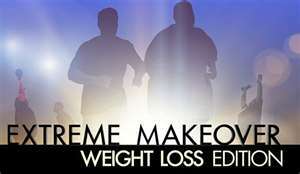 So I cranked up the iPad and started watching Extreme Makeover Weight Loss Edition. I had forgotten about this show, how could I forget? AAAAAAnnnnnnnnnyyyyyyyway, I started the first episode of the season. I am 4 behind, but I started episode 1. I was on the noisiest treadmill so I moved to the elliptical as soon as it was available and got to work. I was doing the interval level and was really pushing hard. Within minutes I was in a full sweat. I was getting more and more into the episode and going fast and harder. About 45 minutes later I realized my workout was over but my show was not. At this point I was 3.45 miles up and 715 calories down. I couldn't stop and such a weird number and the episode was still on so I made it to 4 miles. The whole workout was pretty intense, and entertaining all at the same time. I had a friend come workout next to me so she was watching the show with me for a good 20 minutes, then there was the 12 year old who thought he could run a 3 minute mile on the treadmill. He couldn't! And he was soooooo loud. I just kept waiting for him to hit the back wall. Then there were the 6 other people in the room complaining about how hot it was in there....I thought it was just me but was glad to know it wasn't. I don't know why a health club wouldn't think to make the place cooler than normal, especially since its 105 degrees outside. Overall it was a phenomenal workout, like I haven't gotten in a while. I really felt like I pushed it harder than normal and had fun all at the same time. I just hope tomorrow goes as well as tonight did. I haven't decided yet what tomorrow holds but I am planning it already. Now I'm home pounding water to make up for the lost fluids, having a small snack before bed since I worked out through dinner. That tells you how great it was......I missed dinner!